In the year 2013, smart phone is the number one electronic device sold by shipment. Market researcher Canalys has estimated a sales close to one billion units of smart phones in the year 2013. It has overtaken ordinary mobile phone as well as personal computer and tablet computer. A total of close to 2 million mobile phones (including smart phones) were shipped in the year 2013 not much growth compared to year 2012. But if you see the growth of smart phones alone, they have grown by 44% in shipment in the year 2013 (998 million) compared to 2012, as per Canalys. The PC segment including both desktop as well as notebook is estimated to be declined by 7% in 2013 (less than 300 million) compared to 2012. Tablet computer is also another segment which is growing as good as smart phones, but the shipment in 2013 is not that big, and it is estimated in the range of less than 200 million. There are lot of winners in this market. The most visible is shipment of Android-based smartphones, whose share has grown to 79% in 2013 compared to 68% in 2012, according to Canalys. 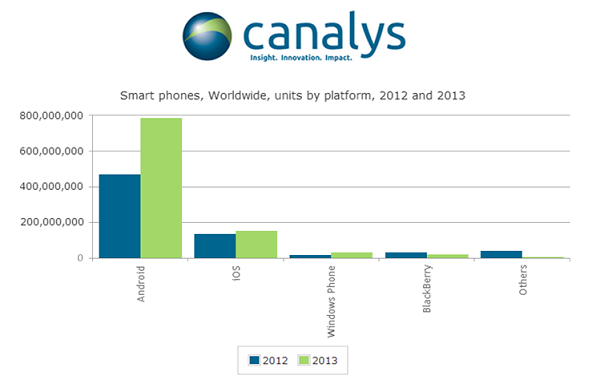 A total of 785 million android powered smart phones were shipped in 2013, as for Canalys. The shipment of Apple's iPhone is also growing but the total share in the market of smart phones is falling. Canalys estimates a shipment of 154 million iOS based devices in 2013. 32.1 million Windows-based Nokia's phones are estimated to be sold in 2013, as per Canalys, which is very small in the total market. Samsung has performed well in the smart phone market in the year 2013 with the tag of number one vendor. Its market share jumped from 30% in 2012 to 32% in 2013, as per Canalys. Huawei has overtaken Lenovo to claim third place, albeit by fewer than 5 million units,as per Canalys. In the fourth quarter of 2013 Canalys estimates a 292.8 million smart phones shipment. Apple has done well in the fourth quarter of 2013 by increasing its market share to 17% sequentially,at a cost of Samsung losing its share. The notable factor is huge number of shipments from China.